THAT’S BEEN OUR SLOGAN SINCE 2008; IT’S BEEN OUR REALITY SINCE 1885. What does that mean for the important woman in your life? It means she gets to be part of an organization where she can be true to herself, learn how to make the most of her talents and realize her greatest potential—all in her own way. It means she’ll be backed by more than 230,000 other Alpha Chi Omegas offering support, encouragement, inspiration, friendship and fun. It means her college education will be enhanced outside the classroom with a four-year learning and leadership program. It means she’ll have opportunities for lifetime leadership and engagement with real, strong women making a difference for themselves, their fellow members and the world around them. Alpha Chi believes in the importance of intellectual development and urges sound scholarship and superior intellectual achievement. Alpha Chi expects members to accept and reflect moral integrity and dignity, social awareness, financial responsibility, fraternity loyalty and interest. Alpha Chi expects each member to be responsible for prompt payment of all dues and fees and other financial commitments. 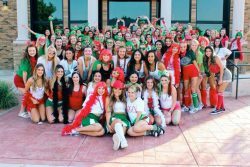 Alpha Chi believes that character, personality, and leadership develop through participation in campus activities and urges each collegian to be interested in her community.